Colombia’s government on Wednesday offered to increase public spending on higher education after hundreds of thousands of students and teachers took to the streets. President Ivan Duque confirmed the opposition and the students’ claim that Colombia’s higher education system was suffering a structural deficit, and the country’s finance minister vowed to reassign $164 million (COP500 billion) to partly close this. The opposition, which consists of both leftist and centrist parties, rejected the concession after demanding the government reassign $325 million (COP1 trillion) of the proposed $1,1 billion (COP 3.5 trillion) military spending increase to education. According to the reported half a million protesters, the country’s higher education system is $1 billion (COP3.2 trillion) short to cover basic operation costs. Furthermore, the students and professors said the universities need an extra $4.9 billion (COP15 trillion) for the maintenance of infrastructure they say has been neglected for decades. The marches were the first public confrontation between government opponents and Duque, who won elections in June after a divisive election race. The leftist opposition, which came out stronger than ever in legislative elections in March, said the concession was not enough. “We believe more efforts must be made” to close the gap in the financing of higher education, said opposition Senator Aida Avella. Finance Minister Alberto Carrasquilla will reportedly meet with the opposition on Thursday to discuss the opposition demands and government concessions. 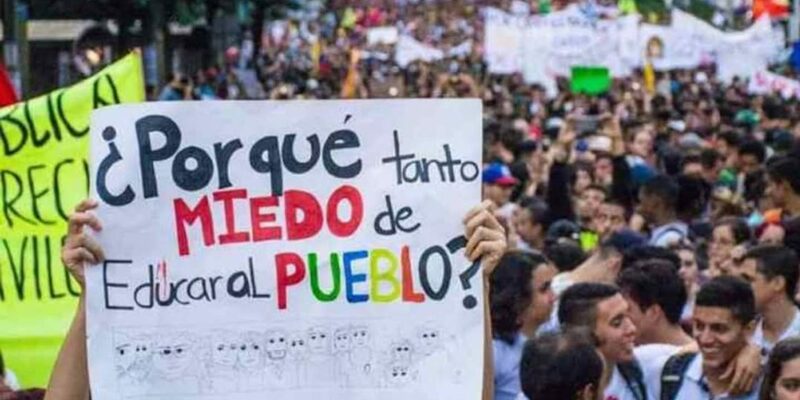 Duque is unlikely finished with the students, who persistently protested against the administration of his predecessor Juan Manuel Santos in 2011 until that administration gave in to their demands. Unlike during the presidency of Duque’s political patron, former President Alvaro Uribe, Wednesday’s protests remained peaceful and largely without incidents. In Bogota, where the largest marches were held, vandals attacked an office of RCN Radio, spray-painting “tell the truth” on one of the building. Other protesters spray-painted buses, but these graffitis were reportedly removed by other students, whose organizations had urged orderly protests.